When I hear the word "pungent" I don't exactly salivate or crave food. Instead, that word is quite possibly one of the worst to describe edibles (well, except for "moist," which is equally as awful, if not far worse). 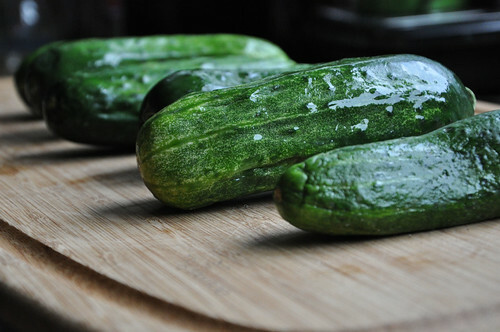 But on Sunday -- when I got all excited about making pickles (in the Edible Perspective style) and realized I basically had nothing I needed -- I started searching through my cookbooks for pickling cucumber uses. The Tassajara Cookbook is one of my favorite because it has so many tasty sauces, marinades, and healthy meal ideas. My particular "take" on this recipe was far from creative. I just used what we had in the kitchen that most closely matched the stuff on the ingredient list. Then I added lime juice because, well, I love lime juice. What resulted is definitely tasty and unique. Definitely a keeper. 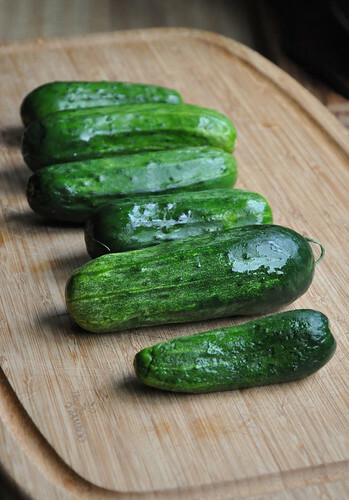 These pickle-like half moons go well on sandwiches or on their own (think SALADS). And I was so surprised how after only a couple hours of sitting in the marinade . . . they turned slightly crisp. They started to get that authentic crunch that pickles have. Very cool. 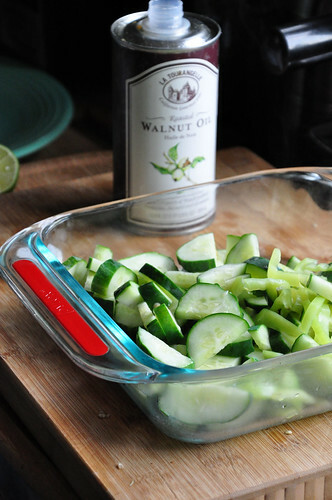 TASSAJARA PUNGENT CUCUMBERS -- the (never home)maker version! 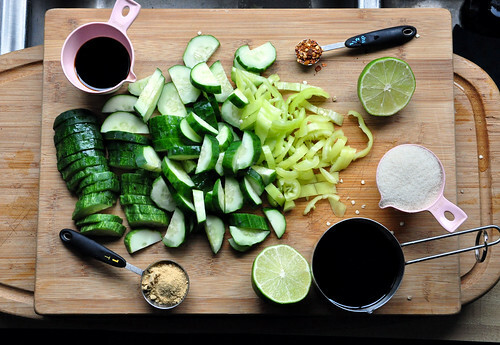 Combine cucumber and sweet pepper slices. Place in a colander and then pour boiling water over them . . . let drain. Heat oil with ginger and red pepper flakes, then remove from the heat. 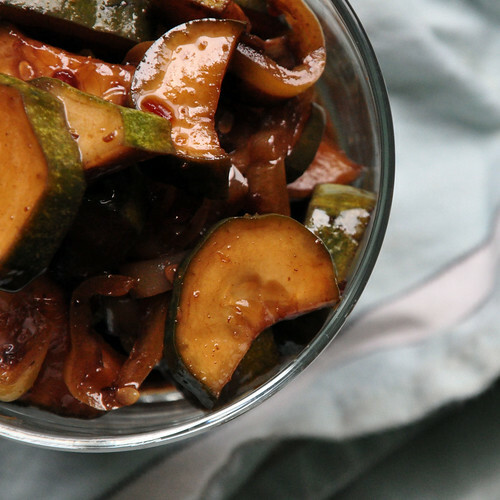 Combine with the balsamic vinegar, sugar, soy sauce, and lime juice. 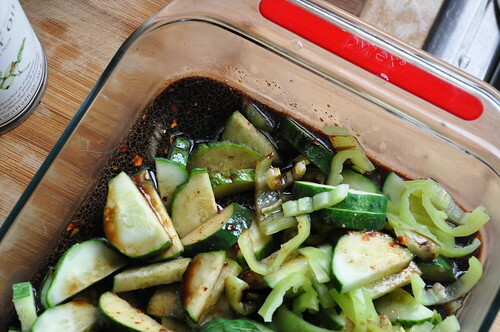 Toss with the cucumbers and red peppers. 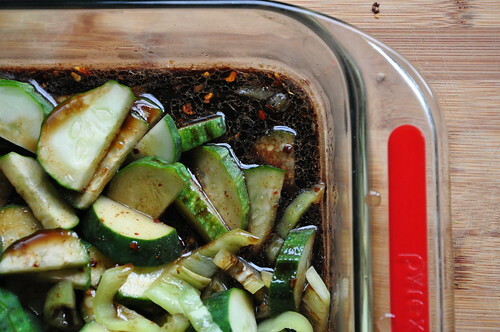 Let marinate for up to six hours. I placed everything in a brownie dish -- you may use to use bell jars. Etc. Serve at room temperature. Serves 4-6. Pssst: Don't forget to enter our SHUTTERBUG GIVEAWAY! A super cute carrot trivet is up for grabs -- perfect for snapping gorgeous foodie photography.